Launch: Hastings Marina, Hastings, MN. 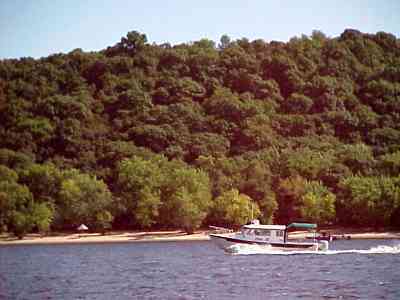 Steep but good ramp, easy access to the St. Croix. Secure parking for your trip. Nice folks. Nearby campsites: Stay at the Marina while outfitting for the trip. 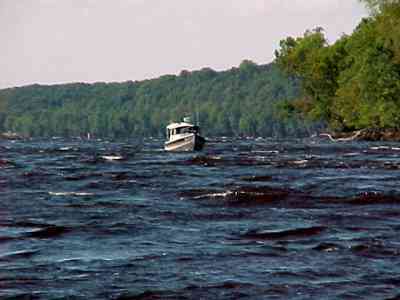 -----The St. Croix River, in its lower reach, is shared by Minnesota and Wisconsin. And shared it is! 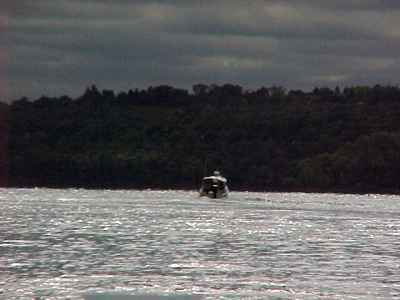 In the summer months, it is a water playground for the thousands of boaters of the region. There are great beaches for swimming, picnics, and parties and the water is clean. The fishing is excellent and the banks wooded and beautiful. It is a much used and much loved river. 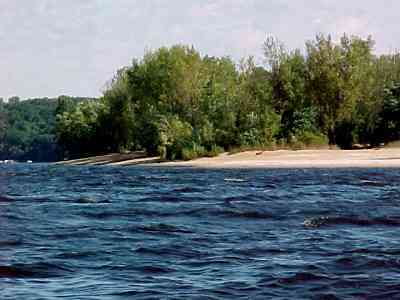 -----The St. Croix is a tributary of the Mississippi River. 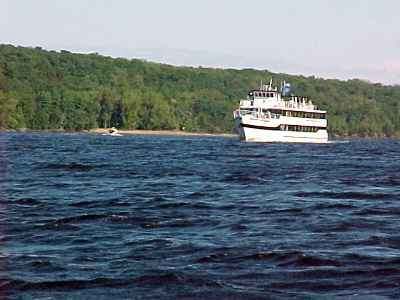 We cruised up the St. Croix from the marina at Hastings, MN, a short distance up the Mississippi from the confluence with the St. Croix. Up and back is a pleasant day's trip, with a lunch stop near the head of power navigation at Stillwater, MN. We cruised the river on two weekdays in late September, after the summer crowds had left. Only the ever-optimistic fishermen and a cruise boat kept us company. Two cruisers - Can you see the little C-Dory Orca to the left of the cruise ship?